InTruBeauty: Morning Quickies: Put Your Best Face (and Hair) Forward! Morning Quickies: Put Your Best Face (and Hair) Forward! Is it the first day of August already? Gross. Where is summer going? I don't like it! Today was one of those days where I woke up and I could tell I needed a little extra TLC. I don't know if I haven't been as diligent about protecting my hair against the sun as usual, or if I've forgotten about SPF one too many times, but my hair and skin were a little meh today. Perhaps it's from sitting out at the water park one too many hours with the kiddos I babysit for. But when the lady at the doctor's office guessed I was 30 before looking at my charts the other day, I was NOT pleased. (No offense, Jessica). 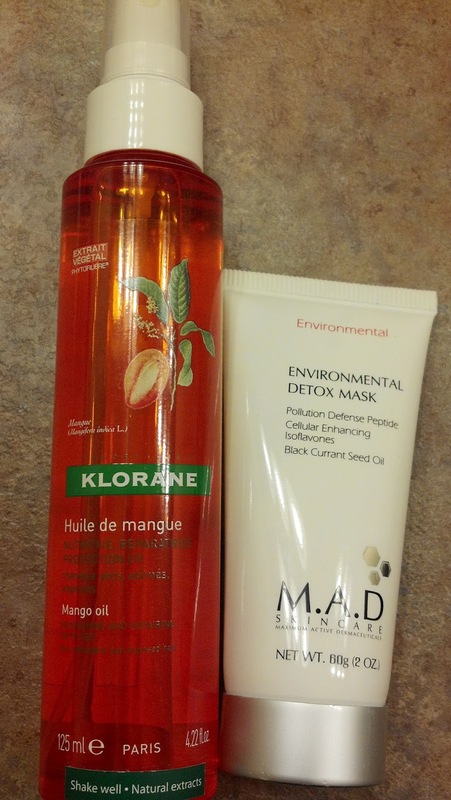 The Klorane spray can be sprayed in dry or damp hair (read: low maintenance- I don't like having to apply a product when my hair is dry because then I can't wash and go). It is waterproof, and protects against the sun while leaving your hair ultra glossy. It's love at first sight, AND it smells good. I dare say it leaves my hair as glossy as when I use my favorite MoroccanOil. The MAD Skincare mask is so easy to use. Oftentimes I skip using a mask because I'm under this false pretense that I need to put on mood music, chop cucumbers to put on my eye sockets, and have 2 hours to lay down for the mask to set. Not with this! Fresh out of the shower, I slapped a thin layer of this on my skin, and by the time I towel dried my hair and picked out my outfit for the day, it was time to wash it off. Unlike many masks out there, it doesn't get dry and crusty and get stuck to your hairline. I simply wet a towel, and dabbed it off my face. THAT easy. BOOM. If you need a little extra TLC, try out this products, they don't disappoint! What are your favorite quick and easy pick me ups when getting ready? Do share! It is always nice to take time to pamper yourself!